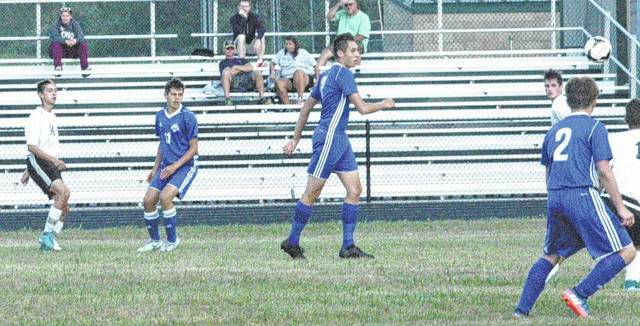 The Lynchburg-Clay Mustangs soccer team hosted the Southeastern Panthers on Tuesday at LCHS, the Mustangs proved too much for the Panthers as they cruised to a 6 – 0 victory. Lynchburg got off to a fast start in the first half as senior midfielder Austin Hilt netted a goal less than ten minutes into the game to give the Mustangs an early 1 – 0 cushion. The match was slow going in the first half as the Mustangs were unable to convert on several other opportunities to score. Southeastern was unable to muster anything offensively and had only one shot on goal in the first half. The match started to get chippy early in the second half and culminated in a red card being given to a Panthers player for an illegal tackle from behind when senior forward Kyle Luneke had an opportunity to score. Luneke converted the resulting penalty kick to increase the Mustangs’ lead to 2 – 0. A short time later the Mustangs were able to score again as several beautiful passes resulted in Hilt notching another goal increasing his teams lead to 3 – 0. With nearly 20 minutes to go in the game junior midfielder Chris Young added another goal for the Mustangs essentially sealing the win. The Mustangs went on to score two more times as sophomore midfielder R. Hornschemeier and freshman midfielder Dawson Osborn both scored for Lynchburg. “We had a couple guys in the first half could have had a goal or two easily in the first half if they had been able to control the ball more. Overall our passing really looked good tonight, When we get in the mindset to pass the ball well we usually come out in pretty good shape.”, said West. The Mustangs and Lady Mustangs both travel to Eastern on Wednesday to take on the Warriors in a Southern Hills Athletic Conference match.